A nearly 400-year-old bonsai tree survived the atomic bomb that killed 140,000 people and destroyed the entire city of Hiroshima around it. 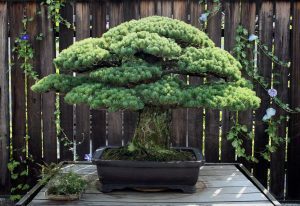 The Japanese white pine, potted in 1625, belonged to a family that lived within two miles of the site where American forces dropped the bomb in 1945. Yamaki’s perfectly crafted trees, including the white pine, were protected in a walled nursery. The family had cared for the tree for five generations before giving it the United States in 1975.